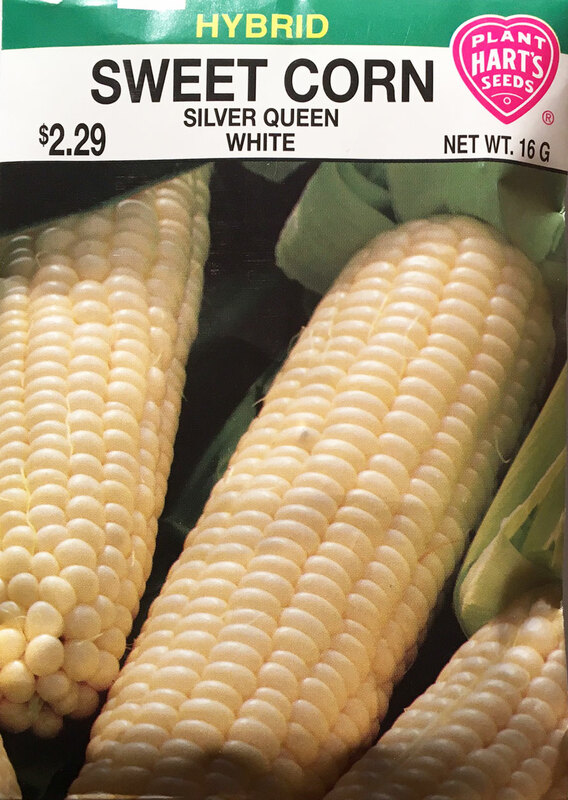 The royalty of white corn, Silver Queen still reigns supreme as the most popular white corn in the country. Everything about her is regal; 8 inch tall stalks, large 8-9 inch ears with the tenderness and flavor that has stood the test of time! Creamy white kernels in 14-16 rows are a late summertime favorite. Corn is a heavy feeder; plan to fertilize 2-3 times during the growing season. Resistant to Northern Leaf Blight and Stewart's Wilt. Pick when silks just start to turn brown. Planting time - in full sun directly in the garden when the soil has warmed to at least 70 degrees and nighttime temps do not dip below 60 degrees. Corn requires full sun and fertile soil. Germinates in - 8-15 days depending on the soil conditions. Seed spacing - 3-4 inches apart in blocks (4 inches by 4 inches) or rows 24 inches apart. Thinning - when plants are 5 inches tall, thin to 10 inches apart. Corn is wind pollinated and crowded plants may not produce full ears.